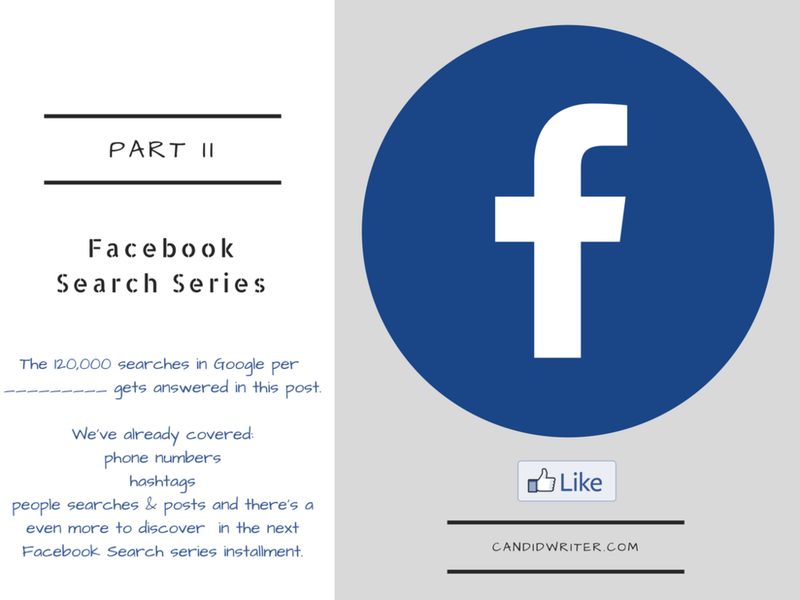 So the last time we talked about Facebook search, it was all about searching using a phone number, hashtags, performing a people search and searching for posts, but there’s more to Facebook search than the sampler that we’ve addressed so far. I left the last post talking about a “really curious topic”. I say that it’s really curious because after looking at the data, there’s roughly 10,000 queries on this topic per month which equates to approximately 120,000 people inquiring about this very topic every year. So that’s what we’re going to start with today as we continue on with the various ways to explore search on Facebook. The 120k question for all these people is how do you complete a Facebook search for people without logging into their platform or signing up and it’s a good question right ? When you consider that nearly 1 in 4 people have a Facebook account, chances are good that if you’re looking for someone or need to connect and don’t want to have an official Facebook account, this particular Facebook search question would be pretty relevant to you just as it clearly is for a ton of other people even if you in particular haven’t really wondered about this before. 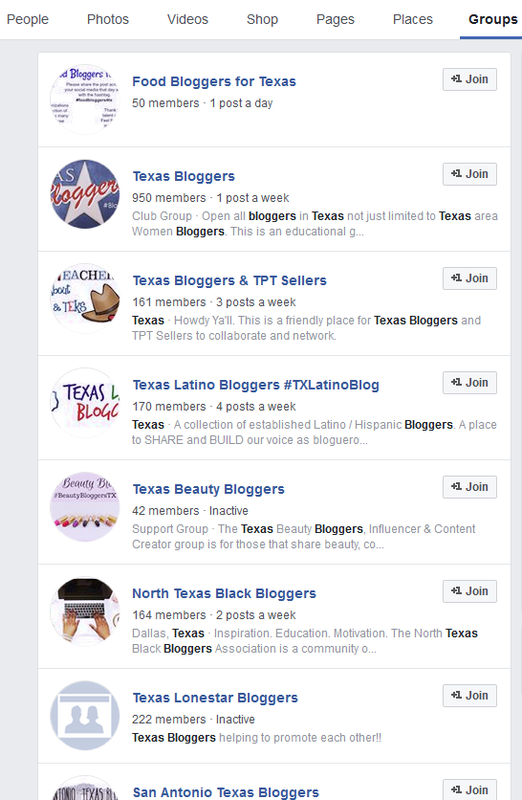 Digging into this, the very first thing that you need to do is navigate to this page: FB people search. Once you’ve done that, it’ll bring up a page that’s pretty simple in scope. You’ll see the Facebook logo, a place to login, a search box where you can type in a person’s name and a “browse by name” section too right underneath. Now here’s the strange part about this page. If you just simply try to search by typing in someone’s name once you navigate to this page, it doesn’t generate any results. Weird right ? However, if you go to the “browse by name” section and click on a letter, you’ll get a ton of results. Now I know, I know.. it’s not targeted and it’s not going to lead you to finding the person you’re looking for but do it anyway okay. Just pick a letter. Any letter will do the job. Once you’ve done that go to the “search for people” box and type in a name of the person you’re looking for and it’ll work like a charm to start generating results for you to comb through. Because of Facebook’s sheer size, most would argue that it’s an extremely powerful medium for finding people online and quite honestly regardless of my personal feelings regarding this platform, it’s hard to deny that fact as it stands. With 120,000 searches done per year whether you’re a Facebook member or not, finding people online and connecting is pretty important. People want effective methods to be able to do that and there’s no denying that Facebook is the hot spot online to go when finding someone is the goal in mind and at hand. So when it comes to this topic the first thing to do is to appropriately explain what in the world the advanced search or graph search is right ? However, before we address that, let me lay on you the bad news.. Facebook did away with their native “advanced search” some time ago and replaced it with the graph search (e.g. the search bar at the top of your Facebook account dashboard). I guess the bottom line regardless of where you position yourself on this topic is that search has changed on the Facebook platform and that change has been labeled “graph search”. The good news and more of an explanation for you is that the graph search on the surface is an engine that does a pretty decent job at allowing you a laser like ability to search within your own Facebook network, but it does more than that as you can imagine including helping you get results that you might not be able to achieve using more traditional search engines and I’ll get into that a bit more as I continue on in the post. Now that we’ve covered that, let’s move on to how to search with the graph search. The first thing that you should do is log in to Facebook and once you’ve done that you’ll see the search bar. This is your graph search bar where you’ll be performing your searches. The Facebook graph search will prioritize generating results that are connected to the keywords that you’ve used in the graph search bar. Now keep in mind that there’s no guarantee that every tab will yield results or even a high number of results per tab as this undoubtedly changes depending on the search that is done. 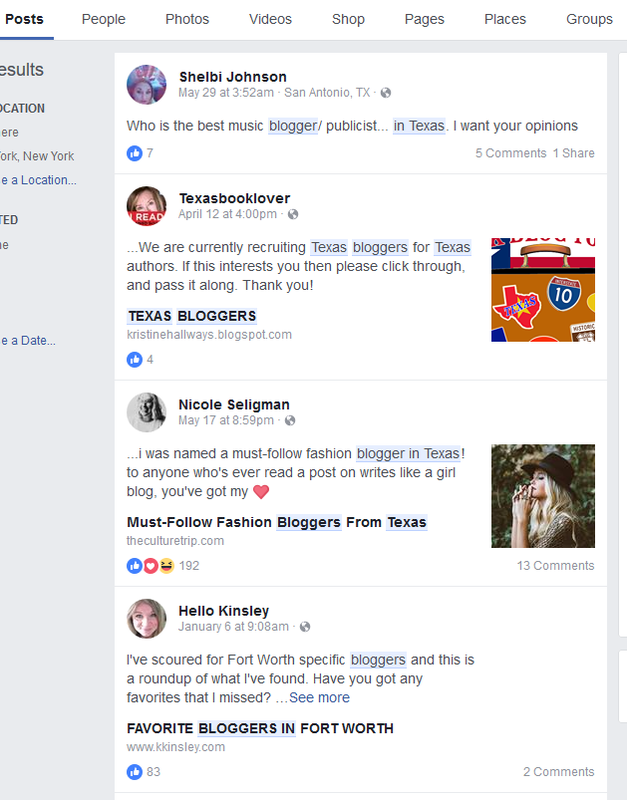 In my example shown here, I did a random Facebook graph search for “bloggers in Texas” and that is the search term that I used without quotes. This is more of a lead generation type of search using the graph search that I thought would be helpful for just about anyone with a blog or website in any niche because we can all use more leads to extend our reach and make additional connections online. Nevertheless, with that said, here are examples of results generated from a few of the tabs. For this example purpose, you can see how this is a powerful method to use to find leads in the niche that you’re in connected to your business or for even personal purposes as well. While I understand that I didn’t go through each of the tabs, the idea here was to give you some insight into what results are generated by doing searches with targeted keywords and see how Facebook responds to those queries and what results it would yield for you in the graph search. Facebook search provides many different avenues of opportunity for connectivity which is certainly purposeful whether you’re a fan or not of the platform. This ends part 2 of my Facebook search series. Here's the next installment of Facebook search where I've addressed even more ways to search with Facebook in navigating their platform for information, connections, content reach and more.